This one is for a Gosling that is hatchling size and a bit larger, (duckling size small) it will fit your gosling for a few weeks. It is very adjustable. Our Embden, the fastest growing of the goose breeds wore this size at 3 weeks. 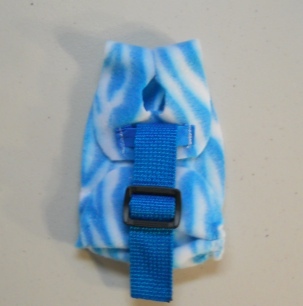 SEE PHOTO FOR COLOR OF DIAPER HOLDER. They grow so fasssssst! If it arrives and it would be a bit too big, wait a day or two (literally) and try it on your baby goose again. The Goose Diaper Holder comes to you with two Pantie Liners to get you started. SHIPPING: We try to keep our shipping and handling as low as we can. Shipping and handling includes not just the cost of the stamps on the package. It also includes the information sent with the product, envelopes, tape, time to pack and trip to the post office. We only ship to the address at the Paypal Account that paid for the items. All Foreign Orders will have the true amount listed on the Custom Papers.